At 580 calories per cup (two scoops), the Rocky Road is richer than the French Vanilla, but only by 20 calories. Most Baskin-Robbins ice creams range from 240 calories to 320 calories per half cup — or one small scoop, with Peanut Butter ‘n Chocolate Ice Cream coming in at the high end. If you guessed the low-fat yogurt is better, you guessed wrong. Actually, in this case the Low Fat Espresso has 180 calories per scoop (1/2 cup), and the yogurt has 210 calories. Just because it says low-fat yogurt doesn’t mean it’s the lowest in calories. The medium sundae is 410 calories, whereas a medium Reese’s Peanut Butter Cup Blizzard is 790 calories. You think that’s high? The medium Chocolate Chip Cookie Dough Blizzard is 1,030 calories. But don’t rush out thinking that sundaes are necessarily healthier. A 19-ounce Denny’s Banana Split is 894 calories. A Banana Split Sundae at Baskin-Robbins is 1,030 calories for 20 ounces — and it also contains more than 100 percent of the artery-clogging saturated fat a person should receive in one day. Any time you get more than one scoop you’re asking for calorie trouble. 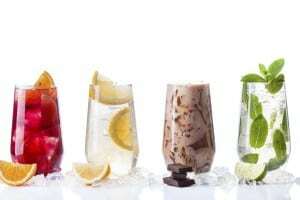 Believe it or not, they’re all about 35 calories per fluid ounce. So now let’s look at serving sizes. TCBY serves up 7 ounces at about 240 calories, the same size as a small DQ cone. Dairy Queen is famous for those chocolate-dipped cones, but if you go for a large, that’s 670 calories; a medium is 490 calories. The Häagen-Dazs bar is 320 calories, but most bars are also high in calories, including the Starbucks Mud Pie Ice Cream Bar (350 calories for 3¼ ounces) and the Dove Dark Chocolate with Vanilla Ice Cream Bar (320 calories for 2¾ ounces). The Good Humor Candy Center Crunch (4 ounces) is 310 calories. A Good Humor Chocolate Éclair bar might be your best bet at 220 calories. An Original Vanilla Klondike bar is 250 calories for 4.5 ounces. Sherbet, made with milk, fruit or fruit juice, stabilizers and sweeteners, has about twice as much sweetener as ice cream and must have 1 to 2 percent milk fat. The Berry Rainbow Sherbet is 130 calories per ½ cup, and the Baskin-Robbins Wild ‘N Reckless Sherbet is 160 calories per ½ cup or 1 scoop. Gelato is Italian ice cream that is served in a semi-frozen state. It’s denser than soft-serve because it has less air. 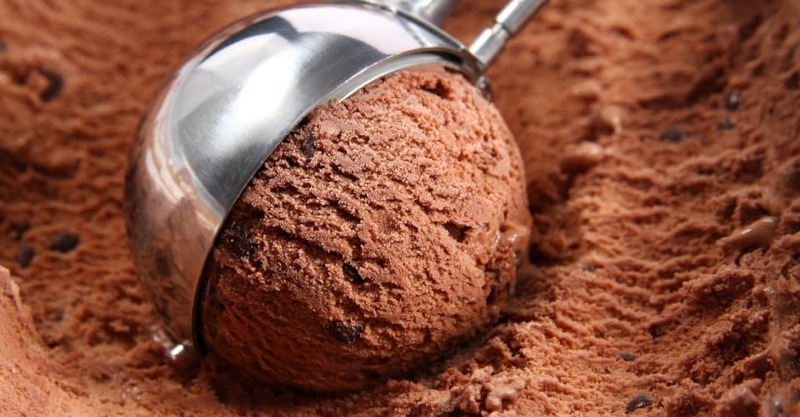 Since it’s made mostly with milk (not cream), it can sometimes be lower in calories than premium ice cream. For instance, Old-fashioned Cream Gelato from a famous Italian gelato maker, now called Grom (www.grom.it) on the Upper West Side of Manhattan in New York City, has 215 calories for a small (about a ½ cup). Their Extra-noir chocolate has 235 calories, as does the Hazelnut. Ciao Bella Vanilla Gelato is 210 calories for ½ cup, and their Dulce De Leche is 243 calories for ½ cup. Italian ices are always a good bet at only 50 calories per ½ cup. Sorbet is one of the lower-calorie #frozen treats on the market. Sorbet is similar to sherbet (often using fruit) but contains no dairy. Half a cup of the Ben & Jerry’s sorbet is 110 calories, whereas the low-fat frozen yogurt is 190 calories per ½ cup (still better than premium ice cream). In Body & Soul, Ben & Jerry’s low-calorie line, the Chocolate Fudge Brownie is 180 calories per ½ cup. Some of the best sorbets sold in supermarkets are Häagen-Dazs, which have 120-130 calories per ½ cup. Häagen-Dazs also just came out with a Reserve line that is offering a fantastic Brazilian Açai (pronounced “ah-sigh-EE”) Berry Sorbet at 120 calories per ½ cup. We also enjoyed the Häagen-Dazs Wildberry Frozen Yogurt, which has 180 calories per ½ cup. At 230 calories per ½ cup, the Starbucks is actually lower in calories than other premium ice creams. Häagen-Dazs Light Dulce de Leche Ice Cream has 220 calories for the same amount, even though it’s “light.” Surprisingly, all the flavors in Ben & Jerry’s organic line, at 240 calories per ½ cup, are lower than most of its regular ice cream flavors. The organics at Ben & Jerry’s are not the lowest of the lows, but they’re the lowest of the highs. The Fudgsicle is only 100 calories per 2.5-ounce bar, and it also comes in a smaller size, which means fewer calories (60 for 1.65 ounces). That’s really a Calorie Bargain. The Skinny Cow Fudge Bars (www.skinnycow.com) are also 100 calories. Get this: A classic Popsicle only has 45 calories in 1.65 ounces. A Creamsicle has 70 calories for the same amount. And what about fruit bars? They’re typically around 80 calories per bar. Not only are they low in calories but some of them, like the strawberry flavor, contain real fruit. PhillySwirl, a Florida-based ice cream company, works hard to put out great low-calorie frozen treats. Some of their great products include the Phudge Sundae and the Fudge Swirl Stix — both 57 calories each. Also, they’re now launching an all-natural product line. Good Humor’s (http://www.icecreamusa.com/good_humor ) Ice Cream Sandwich (3.5 ounces) is only 160 calories, which is great because it’s portion controlled; there’s even a 3-ounce version at only 130 calories, which is a real Calorie Bargain. The worst of all these is the Nestlé Toll House Cookie Sandwich costing 540 calories for one sandwich. Flying Saucers (ice cream sandwiched between two big chocolate wafers) at Carvel are a better bet at 240 calories. And the DQ Sandwich is even less at 190 calories. Skinny Cow’s round sandwiches are an even better bet at 140 calories. Just 2 tablespoons of U-Bet have 120 calories, whereas 2 tablespoons of regular Kraft Cool Whip have only 25 — much lower in calories than I thought. And Kraft Cool Whip Lite has only 20 calories for the same amount. As far as cones go, wafer cones have about 20 calories. Sugar cones have 50 to 60 calories, while waffle cones are about 100 to 160. And chocolate-covered waffle cones can have as many as 320 calories (before you even add the ice cream). The reality is that most of us don’t eat only ½ cup of ice cream, which is the standard serving size listed on the package. Half a cup is about the size of a half-baseball or half-tennis ball. Have you ever seen those small, bathroom-size Dixie cups? Well, if you fill one of those to the brim, with some ice cream oozing over the top, you have your half cup. Not much, is it? It’s about one regular scoop, not a heaping scoop. Most people eat at the very least 1 to 1½ cups of ice cream per sitting — that’s about 500–750 calories. Also, if you think 1 tablespoon is harmless, well, think again. For each one of those spoonfuls, you’re looking at about 30–35 calories.